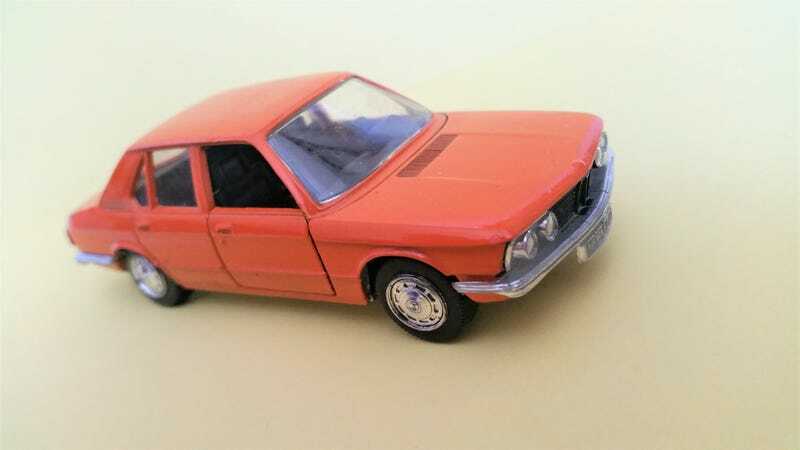 This here is Schuco’s BMW 520 in 1:43 scale, an example of the E12 generation of 5-series, which was the first 5-series generation. This casting has already been featured here before by Small Scale Sydney, so I won’t have to go into much detail about the car or cast itself. As is known, the E12 was the first model known as the 5-series, and supplanted the New Class sedans (1800, 2000) in BMW’s lineup, with the E3 (2500, 2800, Bavaria, 3.0S), and later the E23 (7-series) positioned above it. This particular model depicts an early 4-cylinder 520, with the carburetted M10-family 2.0L, similar to the preceding New Class 2000 sedan. Schuco also offered a model depicting the 525, which had a 2.5L I6, and which they offered in light blue to differentiate it from the (mainly) orange 520. Exterior detail is good, with the vents and body lines done clearly, a fuel filler beside the rear plate, German license plates BM 617, registered to Nuremberg (N), and separate taillight lenses. Interior detail is very nice, with textured seats, a dashboard with gauges, and a centre stack with HVAC vents and other controls. The door cards also have some interior texture and cast armrests. Since the interior is black though, it’s too difficult to pick up with the camera. The engine detail, molded in black plastic, appears to be very accurate as well. Base detail is excellent, with the spare tire imprint, suspension, exhaust, and transmission detail cast in. Like other Schuco diecasts of the period, a couple stats are cast into the base - the (metric) horsepower and top speed for both the 520 and 525, which share this base. I picked up this example several months back. Aside from the paint chip at the front left corner of the hood, it’s in excellent condition. Or was. Unfortunately, the hood broke off while I was wiping down the car with wipes and paper towels. The paper got caught under the hood, and when I moved it, the thin hood support came apart. Vintage Schucos can simply be pulled apart, as they are merely assembled by pressing together, but I’ve never figured how to disassemble them. I’ll probably have to pull this one apart to try to glue the hood back onto the extremely delicate hood support. This one was a loose, fairly-priced eBay find from the U.K., though sometimes I wish I splurged a bit for the boxed blue 525 also offered for about $15 more. The Schuco E12 casting was also offered in a few emergency liveries depicting Polizei (police, green over white) and Notarzt (emergency physician, orange over white) variants. There was no equivalent casting in the 1:66 lineup, but it appears that a modern casting of the E12 has been released in the past few years.